The nine-day festival of Navratri in Hindu religion is dedicated to the nine manifestations of Goddess Durga. The most important Navratri in a year is the Sharadiya Navratra which begins on the first day of the bright half of Ashvin or Ashwayuja (September-October) during Sharad Ritu, as per traditional Hindu calendar. Navratri, literally interpreted as ‘nine nights’ is the most celebrated Hindu festival devoted to Goddess Durga symbolizing purity and power or ‘shakti’. Navratri festival combines ritualistic puja and fasting and is accompanied by resplendent celebrations for nine consecutive days and nights. Apart from the Navratri in September – October, there are three other Navratris in a year. The Chaitra Navratri or the Navaratri in March-April, also known as Vasant Navratri or Ram Navaratri. The other two Navratris are Magh Navratri (January – February) and Ashad Navratri (June – July). These two Navratris are also known as Gupt Navratri and is mainly observed only in certain regions of North India. 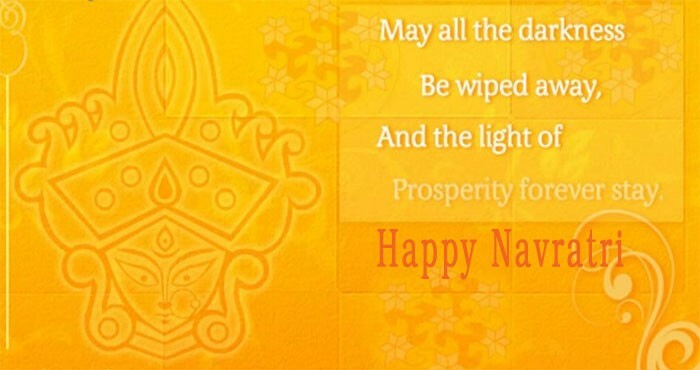 These four important Navratris in a year follow the traditional Hindu lunar calendar. All nine days during Navaratri are dedicated to nine forms of Goddess Shakti. Shardiya Navaratri falls in the month of September or October. 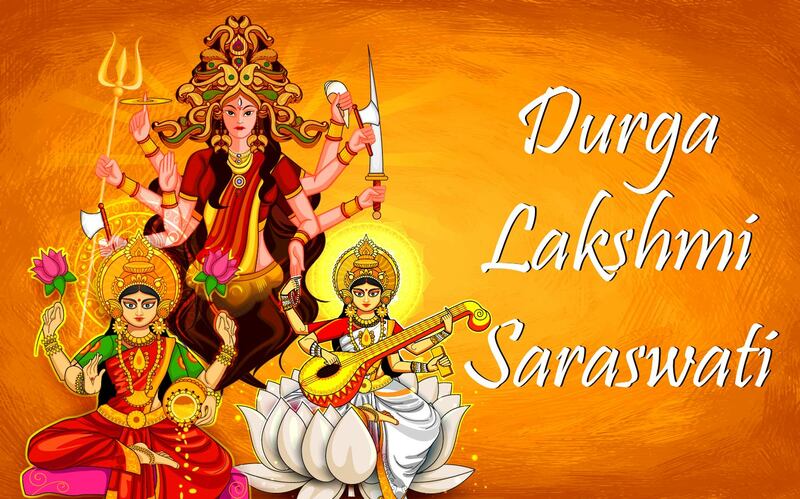 The nine days festivity culminates on tenth day with Dussehra or Vijayadashami. During Navratri, people from villages and cities gather to perform ‘puja’ on small shrines representing different aspects of Goddess Durga, including Goddess Lakshmi and Goddess Saraswati. Chanting of mantras and renditions of bhajans and folk songs usually accompany the puja rituals for nine consecutive days of Navratri. Navaratri is divided into sets of three days to adore different aspects of the supreme goddess. – Durga, Lakshmi and Saraswati. The next three days, the Mother is adored as a giver of wealth and prosperity, Lakshmi, who is considered to have the power of bestowing on her devotees the inexhaustible wealth. The final set of three days is spent in worshiping the mother as the goddess of wisdom and spiritual knowledge, Saraswati. In order have all-round success in life, we need the blessings of all three aspects of the divine mother; hence, the worship for nine nights. Goddess Durga is also worshipped under nine different names for the nine days in Navratri. Every day, she assumes a new character, a new look and a new duty. 1. The first form of Goddess Durga is called ‘Shailaputri’. She is considered the daughter of the Himalayas. She is a form of Shakti, the consort of Lord Shiva. 2. The second form of Goddess Durga is known as ‘Brahmacharini’. Her name is derivative of the word ‘Brahma’, which means ‘Tapa’ or penace. She is also a form of Uma or Parvati, a form of Mata Shakti. 3. On the third day the Goddess is worshipped as ‘Chandraghanta’. She is the symbolic representation of beauty and bravery. 4. On the fourth day Goddess Durga is worshipped in the form ‘Kushmanda’. It is believed that Kushmanda is the creator of the entire Universe and she has created the entire Universe by her laugh. 5. On the fifth day, the form of Goddess Durga is called ‘Skandamaata’. She is actually called so because she is here represented as the mother of Skanda, the chief warrior of the Gods army. 6. On the sixth day, the Goddess Durga is worshipped as ‘Kaatyayani’. Seated on her vehicle lion, Kaatyayani has three eyes and four hands. 7. On the seventh day, the Goddess Durga is worshipped as ‘Kaalratri’. As the name suggests, Kaalratri is as black as a dark night. She has four hands, she is meant to make the devotees fearless. 8. On the eight day, the Goddess Durga is worshipped as ‘Mahagauri’. She is considered to extremely beautiful, white like snow and accessorized with white colored ornaments. She represents calmness and exhibits wisdom. 9. On the ninth day, Goddess Durga is worshipped as ‘Siddhidaatri’. It is believed she consists of all the eight siddhis. She lives on lotus and is worshipped by all.